A table setting with bees that are welcome. I have been thinking about a table setting with a bee theme for over a year but I was waiting for Spring to pull it together. The blue and white flowered tablecloth was made by Spode and I bought it at HomeGoods. I have several tablecloths from there because I have a large table and their tablecloths are inexpensive. I tried a white tablecloth first but the table just needed something extra. The blue scalloped place mats are from Juliska. I love how heavy they are, I wish I had more colors, they are really good quality. I found the bee salad plates at HomeGoods this spring. They have no label except made in china. I didn’t like the brightness of the white circle so I found bee table scatter (tiny wood bees) on Amazon and scattered them on the white circle, problem solved. The dark blue plate is by Ballard Designs, Southern Living. I think I bought them online at Ballard Designs a few years ago. The yellow dinner plate is made by Fiesta and I bought them at Macys about 6 years ago when I started tablescaping. The yellow and white checked napkins came from Sur la Table, they sometimes have good sales on their table linens online. I found the blue napkins on Etsy. I was looking for napkins with a bee design and as soon as I saw the tiny bee design on these, I knew they would be perfect. I found the bee napkin rings after googling bee napkin ring, sometimes that really works when I need something special. They are from PC Fallon Co. and can be found several places online. The green goblets are the same ones I used for my St. Patrick’s table, They are Noritake Sweet Swirl in light green. These were made between 1985 and 2005 and I found them on ebay. That green is a perfect match for the bits of green leaves on the yellow wicker items. The blue goblet was made by Noritake, it’s called Blue Perspective. These were made between 1970 and 1983 and I found them on ebay as well. I saw this bee flatware on another tablescaper’s blog a few years ago and finally decided I had to have them. They are one of the reasons I designed this tablescape. They are made by Wallace and are 18/10, really good quality. I love those bees on the ends. All the yellow wicker items including the salad plates, came from HomeGoods this spring. They don’ t have a label except made in china. I love the bee hive cream and sugar, and salt and pepper. I was looking for something for a centerpiece and found the cake plate first and then the small cookie jar, done! Found the small bee hive candles on Amazon, they are made from 100% hand poured bees wax. You can just see the tiny glass bee on the left in this photo. I have had it for years, don’t remember where I got it but I knew it belonged on this table! I am not a fan of bees although I know we need them but I had fun pulling this table together! I wasn’t going to do a St. Patrick’s table this year but at the last minute, changed my mind, because I finally have six of these shamrock salad plates. How I love the pattern! I love Mr. Leprechaun. Can’t remember where I got him but I think he was made by someone at one of those paint the pottery places. The three little leprechauns are labeled Geo. Z Lefton, 1995. I think I found them at an antique mall. The one behind them is actually part of a set of Santas I have. He is called Four Leaf Crinkle Claus by Possible Dreams but I keep him with my St. Pats decorations. On the other side of the table is Shamrock Crinkle Claus. I bought the glass shamrock at a gift shop somewhere. I think I bought the tablecloth at HomeGoods. The green shamrock salad plate was made in Portugal by Bordallo Pinheiro. I really love this plate. I have six and I have bought them one by one on ebay over the past few years as well as seven others that are the same pattern with a round shape. Finding them all has been difficult and I am still looking for more. The white dinner plate is called Oakdale White and was made by Fitz and Floyd. I think I found them at HomeGoods. I like the braid design around the rim. The charger was made by Mikasa and is called Color Spectrum in Hunter Green. I love this charger, it is heavy and a great color. I have several others in other colors. I bought them all a few at a time on ebay. The clear goblet is my wedding crystal, Lismore by Waterford. The green goblet was made by Noritake and is called Sweet Swirl in light green. These were made between 1985 and 2005, I found them on ebay. The flatware is labeled Helmick/O.M.C. and is called Celtic Crusader. I have learned to buy 18/10 stainless because with cheaper quality flatware sometimes the fork tines have not been filed and are really sharp. I always test flatware by touching the fork tines to see what they feel like. I love the way this flatware looks and it is perfect for St. Patrick’s Day! The napkins are vintage damask and I found them on ebay with a matching tablecloth. The butterfly napkin ring was made by Mackenzie-Childs. They have the same napkin rings now but in blue tones. I loved these napkin rings as soon as I saw them and I bought a couple at a time online over several months until I had twelve. The white place card holder can be written on as well with a special pen. Can’t remember where I bought them but it was maybe Williams Sonoma or Crate and Barrel. I finished the table as the sun was setting giving Mr. Leprechaun a special glow. Happy St. Patrick’s Day! I have started an inventory of all the “stuff” in this house. My family wants me to identify things so that they will know whether it is something I bought on ebay or a family heirloom. I am the only one who knows all the back stories about everything. I started with the top shelf of one of my three china cabinets, this cabinet I inherited from my mother who got it from her mother. I love that it was in my grandmother’s house because she died when I was 6 and I have no memories of her. 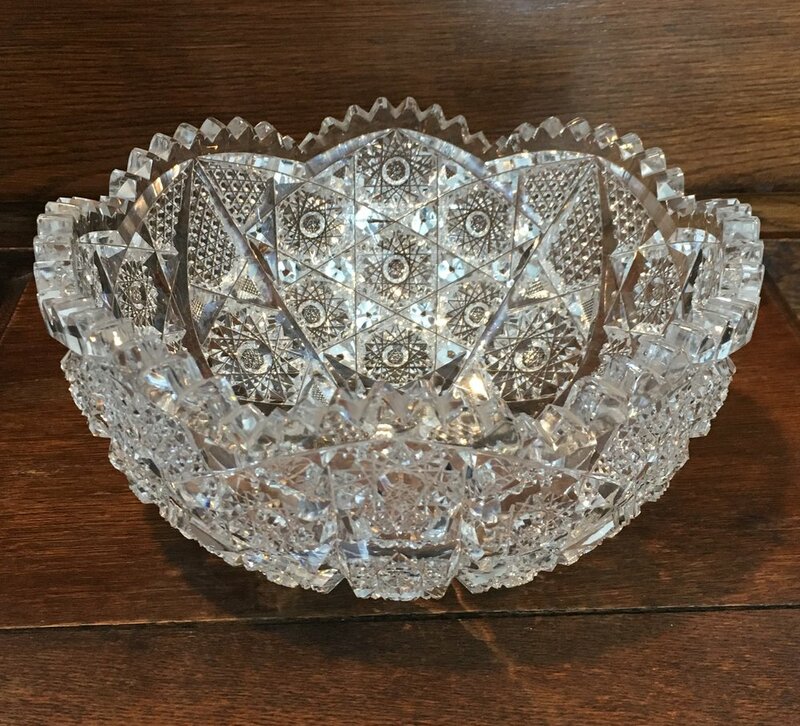 This is the cut glass bowl I inherited from my mother who received it after her mother died. My mother cherished it and so do I knowing it belonged to my grandmother Joanna. The pattern is a variation of the Cluster pattern and it takes its name I think from the group of seven circles in the first photo of the bowl. It is not perfect, it has a few nicks in the edges of the glass but it is priceless to me. I wonder if my grandmother kept it in this cabinet like I do. This is a nappy in the same pattern that I found in an antique mall several years ago. This is a creamer with the same pattern. And the matching sugar bowl with the same pattern, this is a large sugar bowl. It measures 7” across with the handles. I found them both in an antique mall many years ago. This is a small tray that is a variation of the Cluster pattern. My husband gave it to me for Valentine’s Day. This is a large cut glass tray that I bought with money I was paid for writing a feature article about riding trains that was published in the Los Angeles Times. I decided to use the money for something special. This is known as a celery dish. I like the swirl design. I bought it at an antique mall. This is known as a spooner, a place to set spoons down. I like the unique detail on the bottom. I bought it at an antique mall. These are some of my favorite pieces of cut glass. I don’t buy anymore because I have run out of room but I really enjoy owning these pieces. I did a table setting for a charity event this week. I picked a theme that I have done before but my table is a long rectangle and this table was small and round so I had to rework things a bit. The theme is black widow spiders. Ironically we have them in the back yard and I hate them but it makes for a fun table setting. I have to admit looking at the beaded ones crawling up the cloche makes me shudder just a bit. I found them on Etsy, that site never fails me when I am looking for accents for my tables. I found the spider plates on Etsy, I love those spindly legs! I bought the black glass plates somewhere while we were on vacation a few years ago but I can’t remember where. They are made by Luminarc France. They were really cheap so I bought white ones as well. The dinner plate is red Fiesta, I actually use these plates for my every day dishes. The flatware is made by D & D Inox in Italy. I bought it at Neiman Marcus or Bloomingdales during a major sale a few years ago. There are similar patterns available online now. This set pops up quite a bit in my table settings. The charger came from Crate and Barrel a few years ago. I love the way it kind of looks like a spider web here. The black widow spider place card holders came from Pottery Barn a few years ago. I have ants as well. It is blocked in this photo but there is a red hour glass on the back. A couple of the beaded spiders are actually pins that can be worn but I don’t think I would ever do that! I would keep thinking it was a real spider! The spider glasses came from Etsy, the same person who did the small spider plates. The red goblets are my Waterford Marquis. I seem to use them constantly in table settings lately. The quilt topper was made by someone on Etsy, it matches the theme so well. Everything just kind of came together after I saw it and chose the colors. I bought the vintage white damask napkins on ebay. I found the spider web napkin rings on Amazon. I have started looking there first because sometimes shipping is free. Can’t remember where I bought the glass cloche, I have had it for several years. The stand is white plastic, I love things that are plastic and more difficult to break! Can’t remember where I found it. I keep lots of candles on hand, different colors and sizes. This tablescape was very popular at the show. A few people told me it was the best one there so I am pleased.